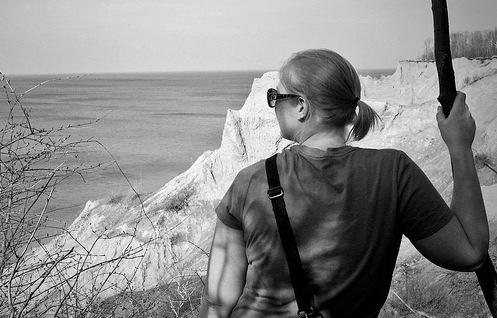 Back in April 2010, Rachel, Kevin, Adam & I drove up to Chimney Bluffs State Park to check it out (I’d always heard of it, but had never been). We hiked late into the afternoon and walked along the water on our way back – a really peaceful, lovely way to spend several hours. I was camera-less at the time, so Rachel let me borrow her ole’ point-and-shoot which I proceeded to fill with pictures. I also shot a bunch of video which, now that I’ve joined the Mac cult this week, I was finally able to edit at home. It’s pretty low-res, but I’m really happy with it because, to me, it very accurately represents how I was feeling that day (no small thanks to Bon Iver / Adam for suggesting music until we got to this). Lookin’ forward to unearthing the rest of my old videos & merging “occasional” video back into my life from now on. Watch the ~2-minute lil’ video after the jump. That was so soothing! Looking forward to MANY MORE VIDEOS in the future. Yay Mac! I am however missing summertime horribly right now, so I hate you. I totally rowed that rock right into Rachel’s heart.